The leaves are turning colors, there’s a chill in the air, kids are back in school, and fewer people are out on the water. It’s a perfect time to go boating! Protective Apparel: Think of fall boating apparel in terms of layers: base layers, insulating layers and outer layers. The article Cold-Water Layering covers these important choices of protective gear. Weather: In the fall, weather can change quickly. Check the forecast before you go. Good sources are weather.gov, weather.com and wunderground.com. Day Length: Daylight hours are shrinking; take that into account when planning your trip. Bring a headlamp, with extra batteries, in case you get caught out when the sun goes down. Being Seen: Low light, mist and fog can make you harder to see this time of year. Wear bright colors—orange, lime green, or yellow. A strobe, bright safety light or chemical lights can be a lifesaver, especially if you’re boating in an area with power boat traffic. Paddler Training: Getting some instruction in boating skills and rescue techniques is a good idea. Check with local paddlesports dealers for training in your area. 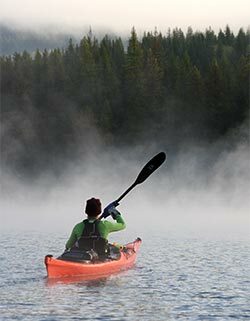 Boating clubs can be a source for classes and the American Canoe Association has a broad curriculum of boating courses. Getting Back in Your Boat: If you capsize, getting back in the boat is a vital survival skill. Purchase a paddle float and bilge pump, and practice using them. Make Sure Your Boat Will Float: If your boat doesn’t have watertight flotation chambers in the bow and stern, add some inflatable float bags. Without flotation, in a capsize your boat takes on much more water and can sink. Good Things to Have in Your Lifejacket: Vehicle keys, whistle, knife, lighter or waterproof matches, fire starters (cotton balls soaked in Vaseline are good), and an energy bar. Good Things to Have in Your Boat: Pack a small dry bag with your cell phone if there’s reception in the area, some warm clothes, first aid kit, emergency shelter like a light weight tarp or emergency bivvy sack, and some high-energy snacks. Keep Your Motor Running: This time of year you need proper nutrition and hydration to keep your body fueled and warm. Read Fueling the Fires Within to learn the dos-and-don’ts of food and beverage intake. Boat With a Buddy: It’s always wise to go out with other boaters. In the cold seasons, it’s even more important; there’s safety in numbers. Let Someone Know Where You’ve Gone: In File a Boater’s Trip Plan we’ve included a form you can fill out and hand or email to a friend. Details of where you’ll be boating, descriptions of your gear, etc. will be invaluable if a search is necessary. Last, But Not Least: Make sure your boating gear is in good shape. We’ve got lots of great resources on gear maintenance and repair in our Learn pages.